Many garden centers sell growing cat grass at this time of year. Many gardeners who love houseplants also have cats that they love. The two don’t always mix. Cats have been known to eat anything that is green – from expensive prized orchids to the seedlings of hard-to-find heirloom tomatoes and peppers you are sprouting for spring planting. Why cats gobble greenery is not well understood. Not all cats do it, so it is clearly not a species-wide need. Some experts say cats need chlorophyll. Others say the greenery cures upset stomachs, allowing cats to cough up hairballs. But the reason doesn’t really matter to a gardener. If your cat is eating prized plants in your house, provide an alternative: cat grass. Need it immediately? 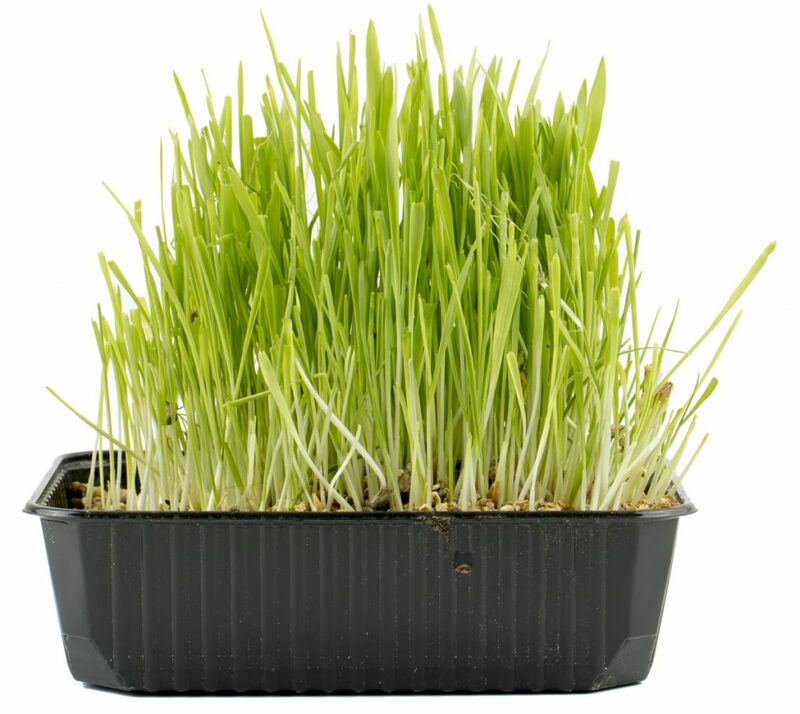 Many garden centers sell growing cat grass at this time of year. You can also grow your own – although the leftover seed you have for fixing bare spots on your lawn may not be the best-suited (even so, some cats probably would eat it). Instead, try a pet supply store or a seed seller. They offer cat-grass mixes, including cereal grains like wheat, oats, barley and rye. Since cats are often picky eaters, they may have preferences, so you may have to experiment. Get a heavy, shallow container – so cats won’t knock it over when they snack. Fill it about three-quarters full with whatever potting mixture you use for seedlings, moistening it before adding it to the container. Spread the seeds thickly and evenly on top, and then cover them with about a 1/4-inch more of soil. Cover the pot loosely with clear plastic, move it away from direct light and keep the soil moist but not soggy. The seeds should sprout in about a week, at which point move the tray to a sunny spot. Offer your kitty a snack when the grass is 3 to 4 inches tall, which could take a few weeks. Repeat the process when the grass begins to look ratty.